Here is where I keep you all updated on the current Papa John’s discount codes. Papa John himself loves to get on TV and share all of the new discounts and unique pizza spin-offs that his company is creating. When I see one of them I immediately run to the computer to make sure that the promo code or coupon is up on my site. I feel like there is a new deal every single day. How does he have the time to run the company and star in so many commercials? Most of these deals come from the emails I get for subscribing as a Papa Rewards member. Come back often for newer discounts. FYI – People love a surprise Papa John’s pizza delivery on Super Bowl Sunday. 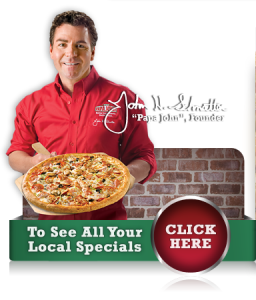 Papa John’s Early Week Mania! NOW Any Large Pizza $8.99 !! 50% OFF Large Pizzas at regular menu price when you order online! Promo code must be entered for each pizza ordered. Papa John’s EARLY SUMMER SPECIAL! Get 2 Large Pizzas with up to 3 Toppings for only $15!. That’s a lot of great Pizza to ENJOY. Choose your favorite toppings or build a new favorite! Happy Summer! Offer available Online and Instore. Order Online or call your neighborhood Papa John’s to redeem this great offer. Offer not valid in Alaska, Hawaii and Canada. Use the promotion code T618EWM.